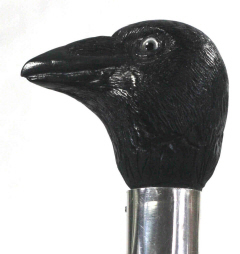 Hand carved study of a crow. Silvered eyes.The mounted on ash, chestnut or beech. The cane finished with a hand made fully hallmarked sterling silver collar or a copper and silver planished hand made collar. These canes are designed as country, show or light use canes. These canes are not designed for every day disability use. 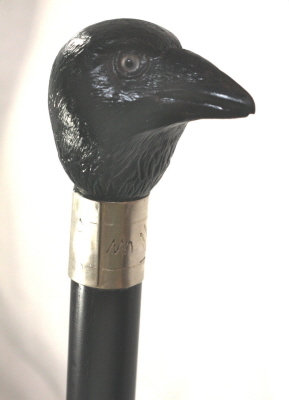 The cane is made to order with an arrival time of approximately 6 weeks.